This time, we have an offer of Samsung untested customer returns for You. This lot is available to purchase from one of the UK wholesalers, and consists of couple of different types of Samsung electronics. All of these Samsung electronics are untested customer returns. We do not now how many of them is sold in original boxes, or what are the exact quantities of the certain types of devices and appliances. Still, the UK wholesaler informs, that he will be very happy to provide all potential buyers with the packing list and pricelist. 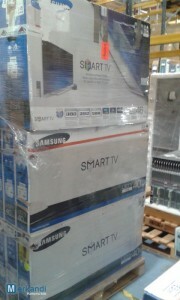 The lot includes Samsung wholesale tv sets, multimedia and some brown goods too. The only way to obtain this wholesale lot of Samsung untested returns, is to buy the total available amount.